^ Wray Vamplew. Encyclopedia of Traditional British Rural Sports. Psychology Press. 2005: 75–. ISBN 978-0-415-35224-6. ^ Iona and Peter Opie, Children's Games in Street and Playground: Chasing, catching, seeking, hunting, racing, duelling, exerting, daring, guessing, acting, pretending, Oxford: Clarendon, 1969, p. 232. ^ 3.0 3.1 Robert Hendrickson. Ladybugs, tiger lilies, and wallflowers. Prentice Hall General Reference. 1993. ISBN 978-0-671-79910-6. ^ Alice Bertha Gomme. The traditional games of England, Scotland, and Ireland: with tunes, singing-rhymes, and methods of playing according to the variants extant and recorded in different parts of the Kingdom. D. Nutt. 1894: 77–. refers to Conkers as "the same game as Cogger" and states that it is more generally known as "playin at sneel-shells". ^ World Conker Champioships news. [2013-04-10]. （原始內容存檔於2013-09-21）. ^ Myth: Kids must wear goggles to play conkers. Health and Safety Executive. [2008-10-27]. 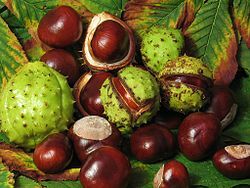 ^ Conkers get safety group backing. BBC News. 2008-09-26 [2008-10-27]. Eichhorn, Markus. The Conker Tree (Horse Chestnut). Test Tube. Brady Haran for the University of Nottingham. October 2010.